We’ve been hearing rumors for a couple of weeks that several key individuals from the Diablo III art team recently left Blizzard, though reasons for this were nebulous. Evidence of this is starting to make the rounds, and Kotaku has picked up on it with a post highlighting Blizzard’s new, featured job opening. Blizzard Entertainment is currently looking for a talented, motivated, and experienced art director to lead the Diablo III art team. For this position, you must be highly organized with outstanding communication skills and proven experience in management. We’re looking for a proven track record of shipping AAA products in an art director role. Experience modeling and texturing assets for a diverse visual range of environments and a solid grasp of form, color, and light for both 2D and 3D art assets are also essential. You must be experienced at mentoring a team, able to work well in an environment of artists who are passionate about making great games, skilled in another art task (illustration, modeling, texturing, animation, or concept drawing), and well-versed in related tools (Maya, Photoshop, etc.). As the Kotaku piece points out, Brian Morrisroe was Diablo III’s art director as recently as the WWI, where he headed the Environmental Art Panel, and did some media, such as this interview with CVG. 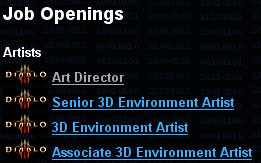 What the Kotaku piece doesn’t mention is that there are several other D3 art team jobs listed on Blizzard’s jobs page. None of them are recent additions, but it would seem that Blizzard is having trouble finding/keeping art talent on D3? Also note that Jay Wilson, Diablo 3’s Lead Producer, handled the fan screenshot deconstruction. Why the head designer, and not one of the art directors? Given this state of affairs, it’s hard not to speculate (as several emailers have) that perhaps the controversy over the game’s art direction wasn’t just amongst the fans. Perhaps different factions within the Diablo 3 team had their own strong opinions on how the game’s art should look, and when push came to shove, some of the crew left. Or were asked to leave? Happily, as Blizzard often points out, the production of a game as large as Diablo 3 is handled by a large team, and no one is indispensable. Let’s hope they get talented job applicants and can plug them into the openings and carry on smoothly. Regarding Brian, he recently resigned to form a startup technology company (outside the game industry), which is why we’ve posted about the open position. This change won’t impact the game we’re really pleased with the look and feel that Brian helped create for Diablo III, and the new person we bring onboard will work with the other artists on the team to maintain the art style moving forward.